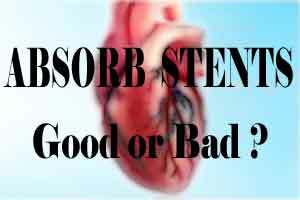 The medical community, cardiologists in particular, have been very exicited for the past few year with the introduction of Bio-resorbable Vascular Scaffolds, or what we commonly call Absorbable Stents. Indeed, the concept of a stent, which after seving its purpose, gets dissolved itself leaving the vessal valve intact, is very attractive ; thus making Absorb Stents very popular to use despite having a a very high cost. These stents were primarily introduced to reduce the late complications of the drug-eluting stents which manifested themselves many a times as Late Stent Thrombosis. Although the initial ABSORB cohort studies and the recently published randomized trials ABSORB II and III as well as the EVERBIO-2 Trial provided data in support of the safety of these absorbable stents. However, an unexpectedly high incidence of scaffold thrombosis (ScT) has been reported in single-center and multicenter observational studies and in a recently published meta-analysis. In one of the registries called GHOST-EU (Gauging coronary Healing with biOresorbable Scaffolding platforms in EUrope) registry, it was unexpectedly found that the six-month incidence of Stent Thrombosis was two percent after six months, with these absobable stents. Moreover this figure became as 3% in another registry, called the academic medical center single-center registry. This figure is unexpectedly high, when compared the incidence of stent thrombosis with standard drug eluting stents, with EVEROLIMUS which has a figure of 0.3%. These figures were manifested even in the BVS EXAMINATION trial, where a tendency toward higher rates of early ScT was observed in patients who received BVS compared with DES or baremetal stents. Rates at 1 month were 2.1% for BVS, 0.3% for DES ( Drug Eluting Stents), and 1.0% for bare-metal stents (p ¼ 0.06 for BVS vs. DES). The restenosis rate is not inferior to that achieved with the latest- generation EES stents, nor is it any less. The deliverability to distal lesions may be more problematic. One-year event rates are not inferior to those for EES stents in terms of ST and major adverse cardiac events, but these all trend in the opposite direction than desired. The other advantages remain to be fully understood but may be very important. The current observation by Serruys et al. (7) of restoration of more normal vascular flow and physiology, as well as response to healing after the device has been completely degraded, is extremely important and remains an important opportunity. It is hoped that these benefits will also be seen when the patients in the ABSORB III trial reach 5 years of follow-up. The fact that the artery is not trapped within a metal skeleton may also make it possible to proceed with subsequent bypass surgery. “Here today, gone tomorrow” remains an incredibly intriguing concept that still needs further development and follow-up to reach its full potential.